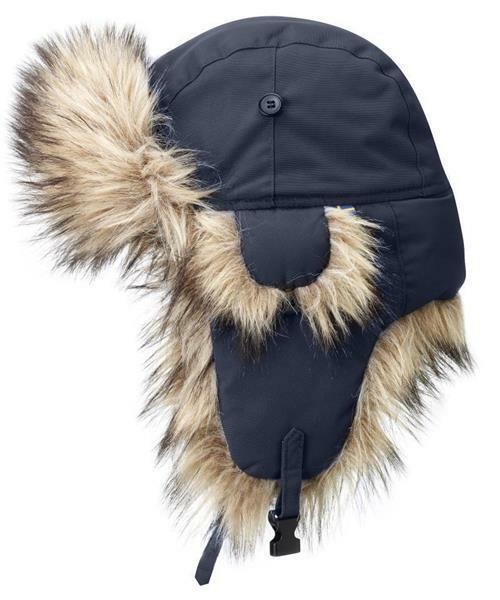 Extremely warm hat with synthetic fur on the peak, ear flaps and edges. Provides perfect warmth and protection against the wind in both polar climates and biting winds. The outer material is soft, quiet polyester with fluorocarbon-free impregnation. The ear flaps can be folded up and fastened with a button on the side, or held in place with a strap under the chin so the hat stays on in strong winds.